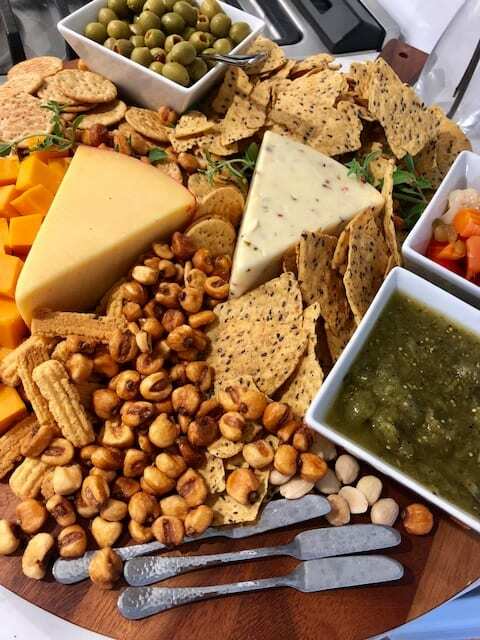 Last week we gave you a very detailed description of our Spring Event Services, and you all know we love some good inspiration, so we thought what better way to show what we are thinking than to follow up with a Spring Dinner Inspiration post. This will give a taste at what we come up with when planning for our event clients and the process we take to get there. 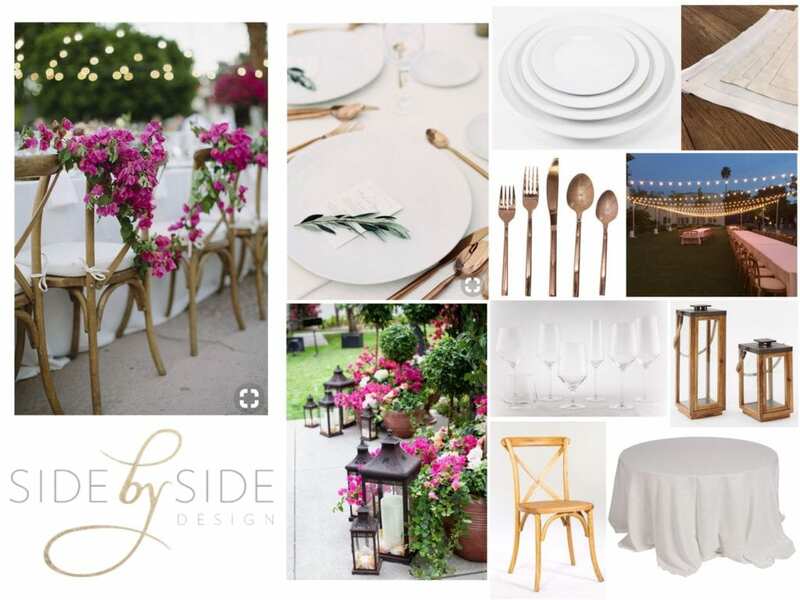 First things first, we always create one of our signature inspiration boards to show our clients what the overall look and feel of their event will be. Isn’t this the perfect setting for a spring dinner of any kind? Start with a little ambiance! We love the way lights drastically change any space, and these String Twinkle Market Lights will make such an impact on an otherwise neutral backyard setting. 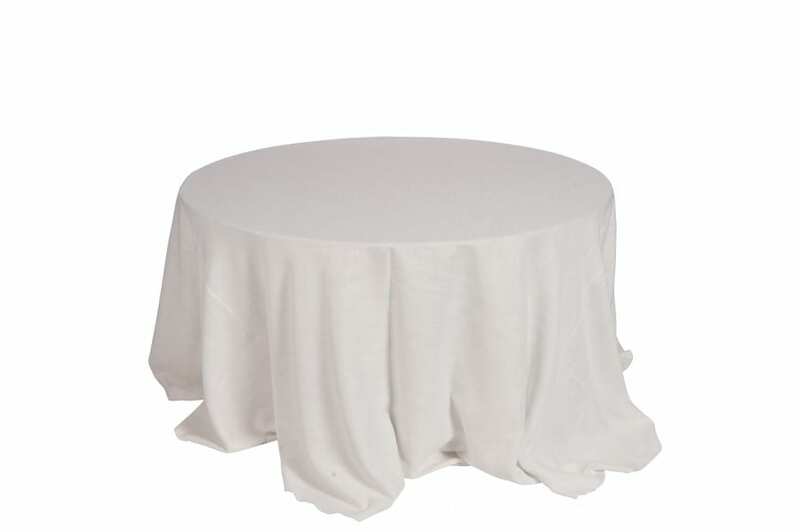 … and these Ibiza White Linens. Now we have created that gorgeous white backdrop we were going for! This table setting is a perfect compliment to the photo we chose to portray the overall look. It is also crisp and clean but has some great unique features as well. 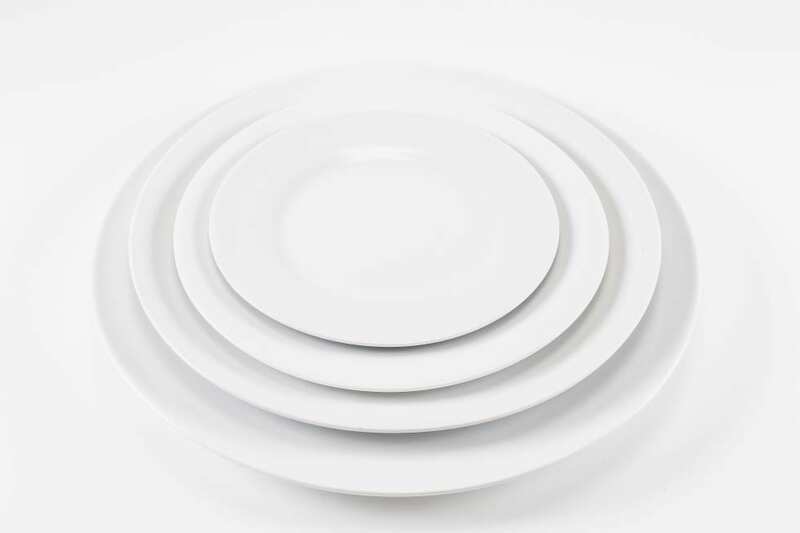 … along with their White Elegant China. 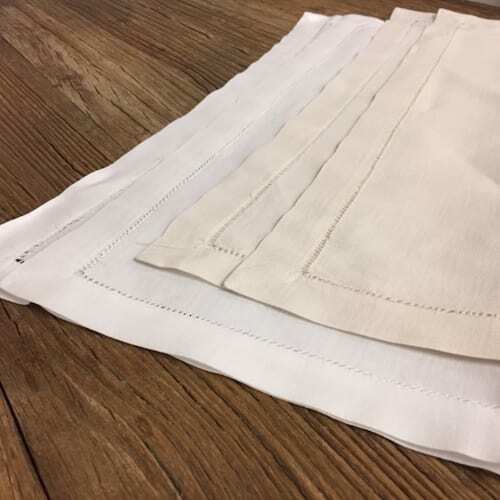 Add a bit of texture with linens such as these Ivory Hemstitch Napkins. 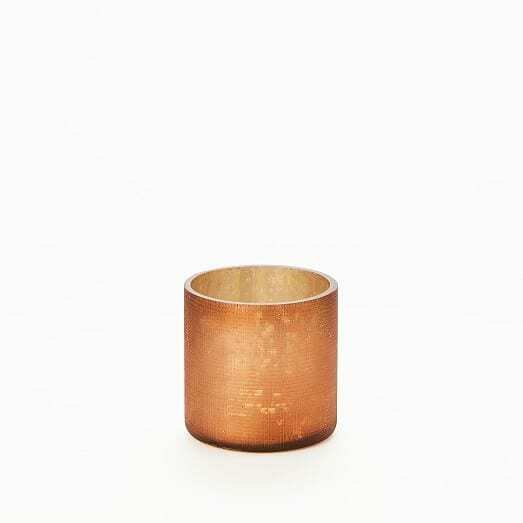 Rose gold is all the rage right now! 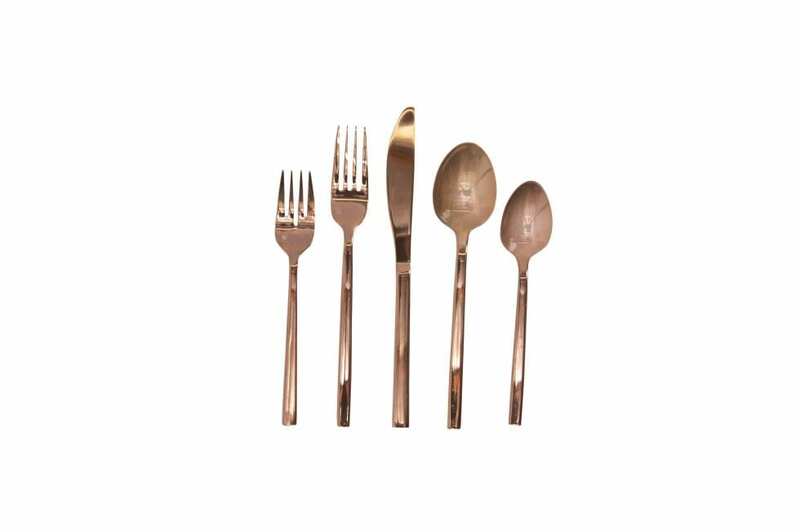 This Rose Gold Flatware will add a unique touch to the otherwise white table and will be loved by all of the guests who attend this special dinner! 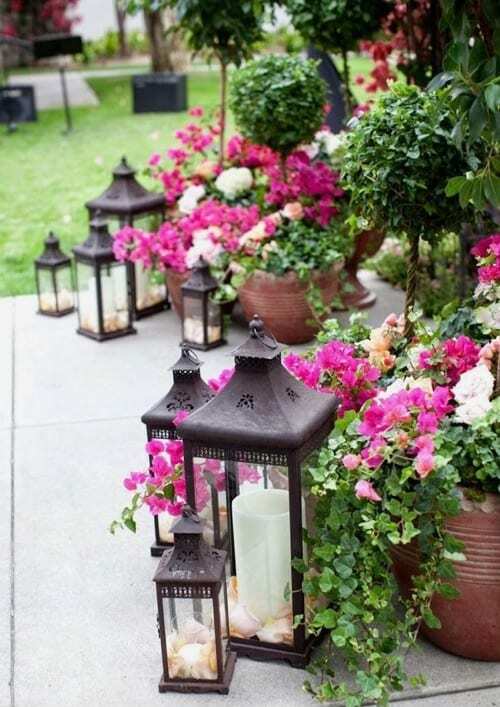 This last photo shows how to incorporate the overall look of the event’s decor into more of the backyard setting. 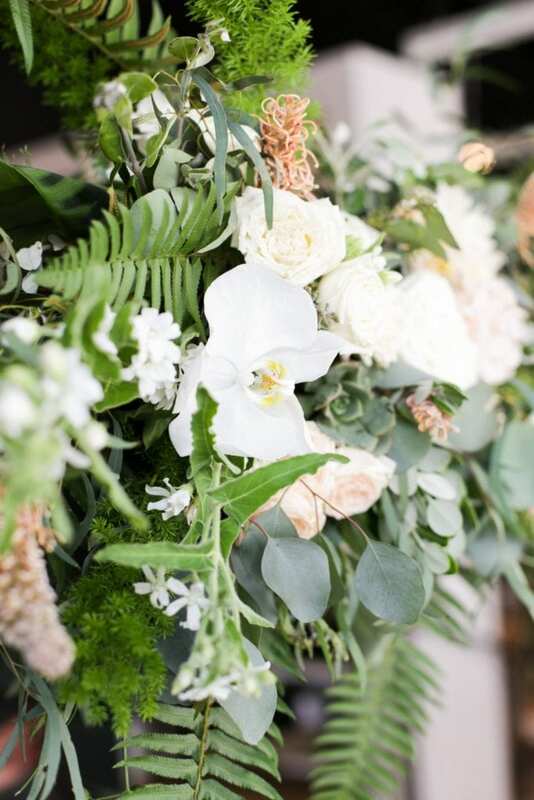 Obviously, you can’t have this look without bringing in the proper florist (or gardener if you want to have this look all year long), but there is one more thing we think is a must have! 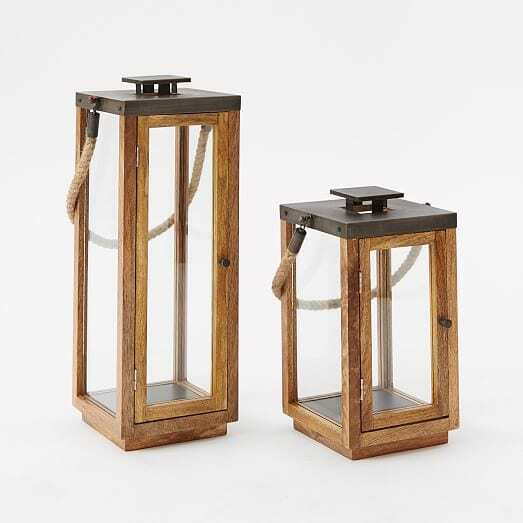 We saw these Wood + Rope Lanterns at one of our favorite affordable places to shop (West Elm) this week, and they modernize the look a bit. Plus they are so fabulous! We really are just a phone call away if you are still looking to put together an event in your home this spring! For more information on any of our Spring Services please contact us at info@sbsdesignla.com or call Tami Daks, our Event Coordinator, at (480) 628-8264. 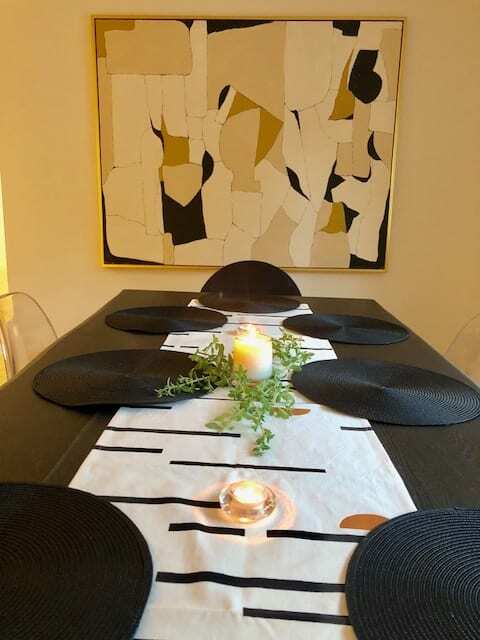 Our newest series, Hosting at Home, is a place for us to share the creative touches we add to our space when hosting in our own homes as well as tips from us as event planners for how to pull off a similar look or type of event at home. These events are not fancy and super pre-planned like the ones you are used to seeing us do but rather casual and impromptu. 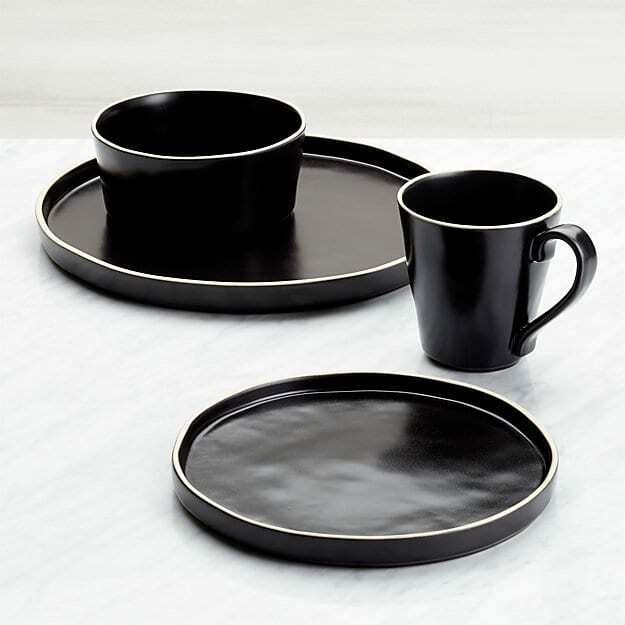 The content of these particular blog posts is meant to inspire each of you to invite friends over for a last minute BBQ, to pull out dishes you haven’t used in a while, and to find those random accessories that help make your table look unique. Keep it causal! None of this is sponsored … It’s from the heart and straight to you from our very own homes. Enjoy! My friend Nelly and have been talking about putting together a Tacos and Tequila night for some time, and we finally decided to tie it into Scott’s birthday … Cuz why not? 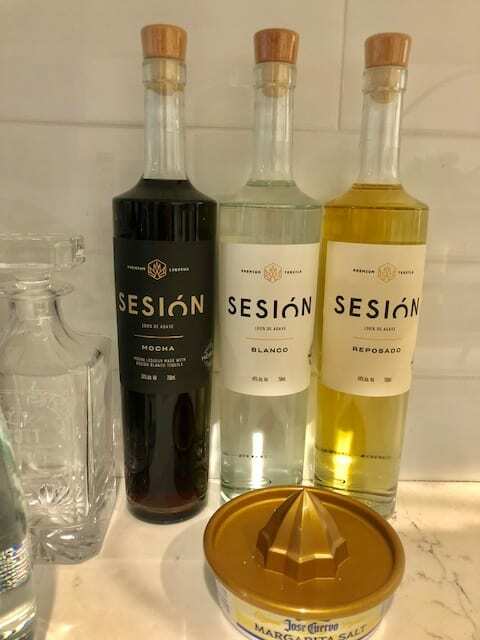 We had some awesome bottles of tequila on hand (Hence where the idea came from. 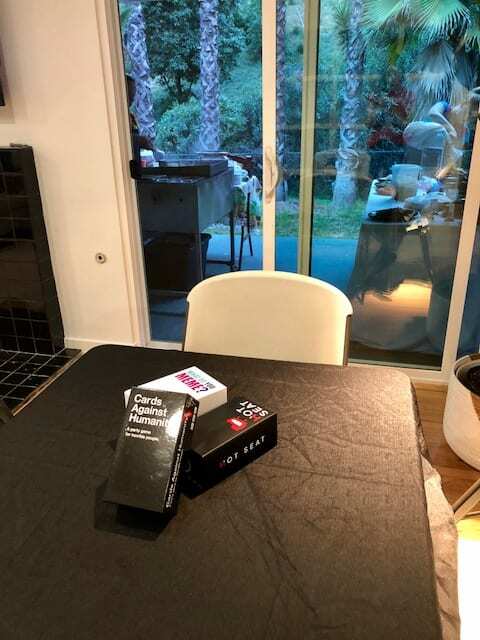 ), hired our favorite taco cart, invited our closest friends, and decided to make it a game night as well … But of course I couldn’t just stop there! When hosting at home, I love to put my personal spin on each and every event, and somehow they usually end up turning out a little fancy even when the theme may not be. Thanks to my in-laws, I had a quiet home the day of the event and really enjoyed putting the whole look together. I had ideas beforehand of course, but the finished look exceeded my expectations. As a hostess, I always try to dress the part and fit the look of my event. In this case, I knew I would be running around, so I wore my favorite flats and a comfy pair of jeans but with a festive red top. I put out a few decorations on my breakfast table to add an extra place for people to sit. Shh … Don’t tell! I took a frame I have and turned it upside down. 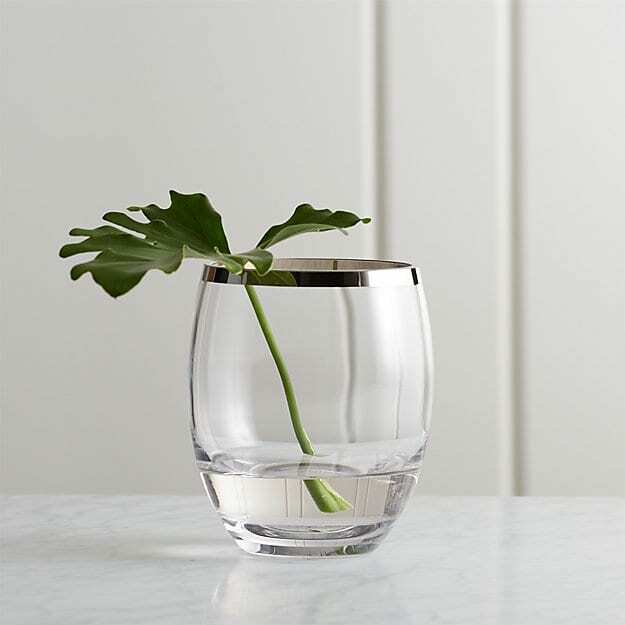 Add a candle and some greenery, and you got yourself a centerpiece. The main eating took place on my brand new dining table that I got delivered that day (Talk about timing!). To protect my new table, I put down this festive runner I have been waiting to use and some round woven placemats. 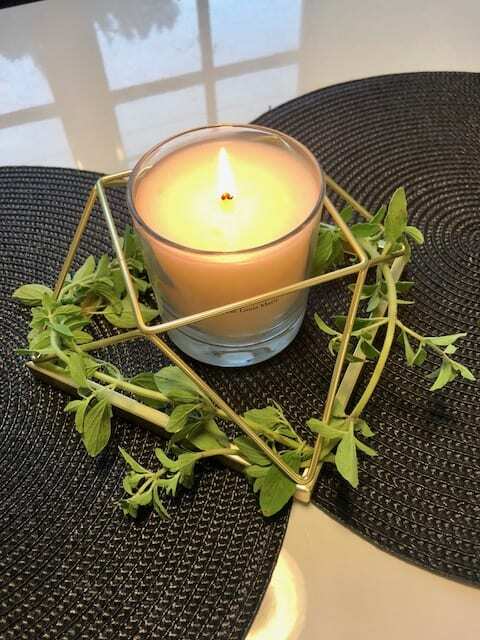 A few candles and some fresh sage from my garden completed the look and smelled amazing. Here’s a tip … Find creative ways to use what you have on hand. 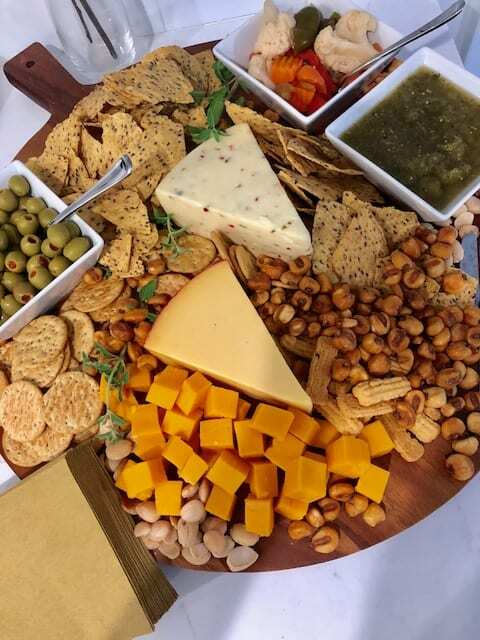 No need to buy all new decor when hosting at home! 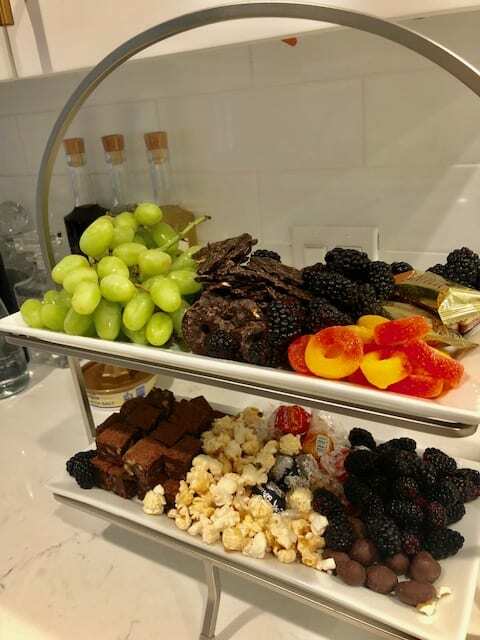 I set up stations in my kitchen with appetizers, desserts, and drinks each with a festive touch. The tequila bar featured three flavors of Sesion (Mocha being my personal favorite which we drank at dessert time.). I filled a little leather box I had with all of the accessories needed to make your own drinks. 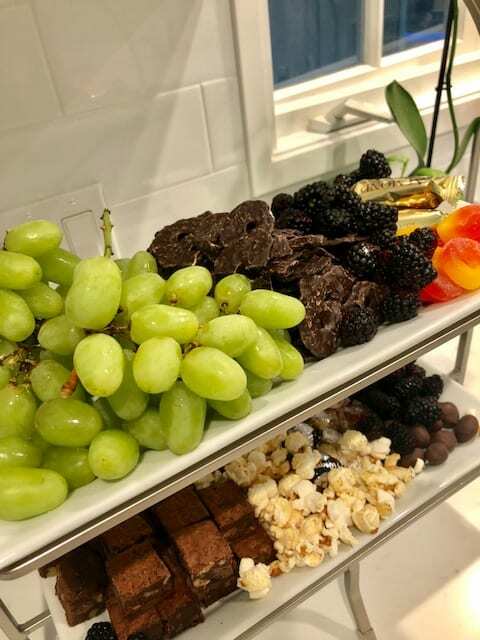 … and a dessert display for those with a sweet tooth! 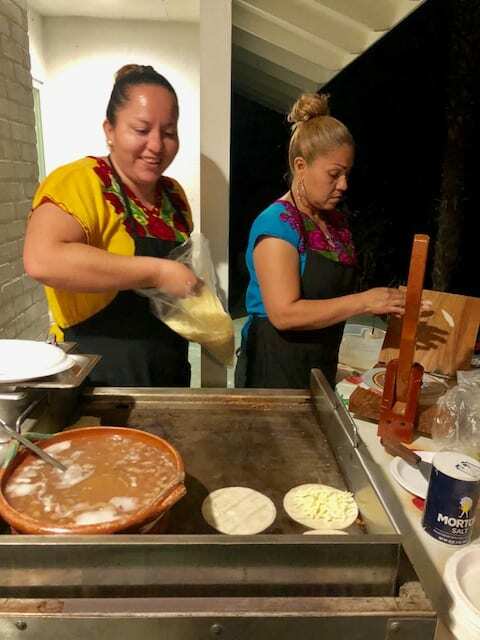 You can’t have a Tacos and Tequila party without tacos! We hired my favorite taco cart company. Their food is so good! In our house, games and gifts go hand in hand. We are a bit competitive, but we know how to reward our winners! A little celebratory treat at the end of the night is appropriate for every birthday! 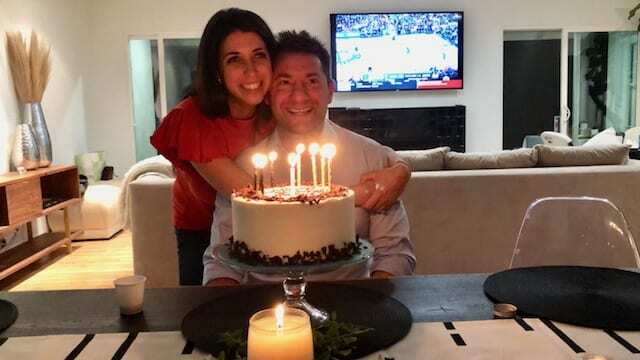 Happy Birthday Scott! Thanks for giving us all a reason to celebrate! When hosting in your home, do what feels most natural to you while trying to push yourself a little each time to think outside the box. Until next time … Happy Hosting from Side by Side Design! 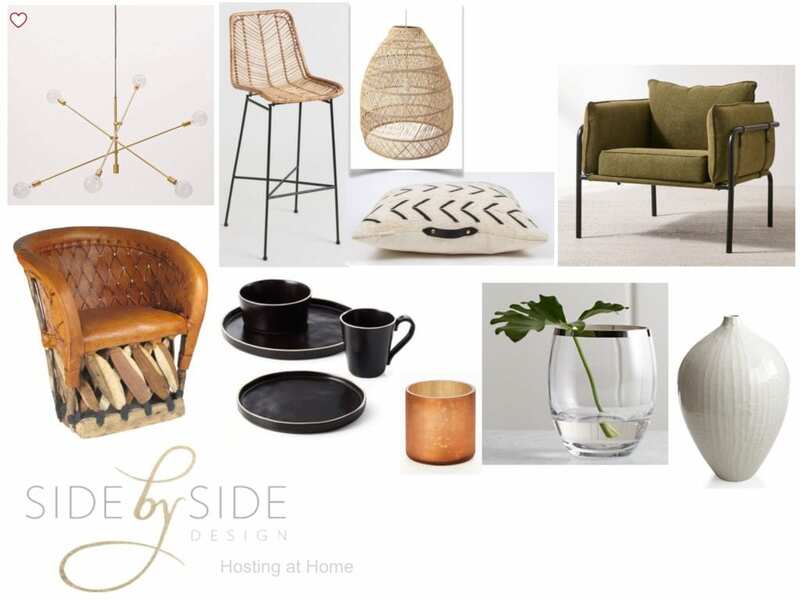 By taking one of the looks from our Get Inspired: April boards, we are providing our readers with further information for where to purchase similar items with a range of price points (from super affordable to fancy and one of a kind). 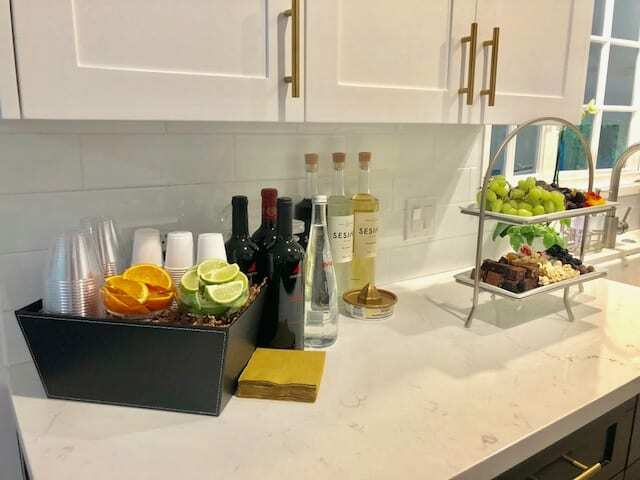 I absolutely love hosting small get togethers in my home! This month, I am working to finalize more of my spaces so I can do just that! 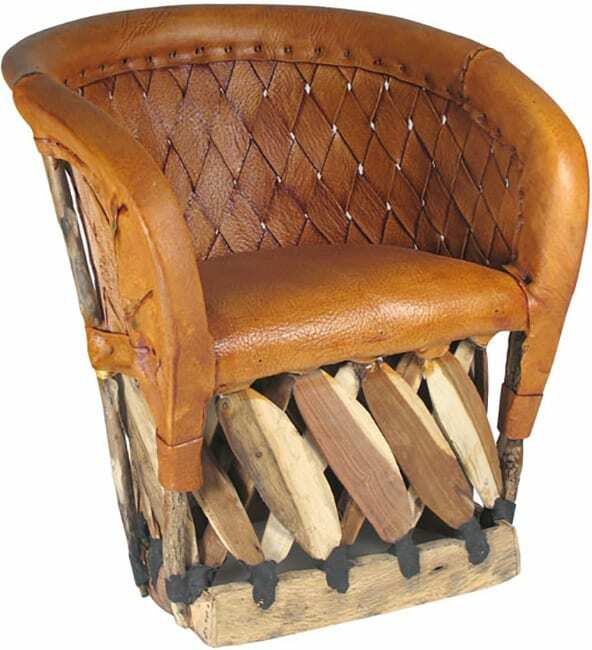 You may even see some of the below items (or ones similar) in my design. I believe all of these statement pieces are great all year round and should be out not just when you are entertaining. Don’t worry, I included a link to make getting each item that much easier (In case you want them too!). Enjoy! Hosting at Home this month? 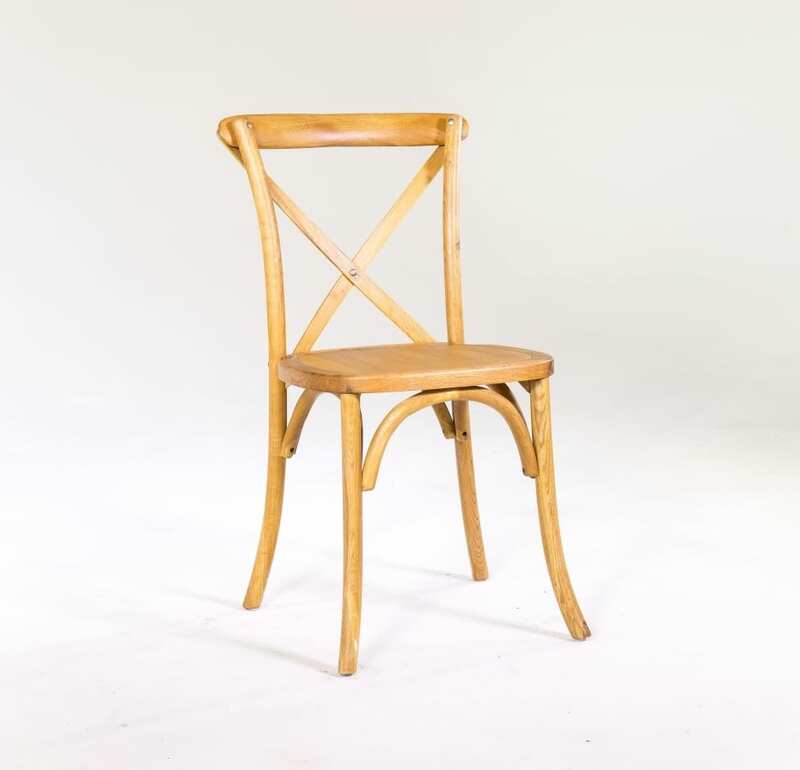 Why not incorporate one or more of these items into your space? 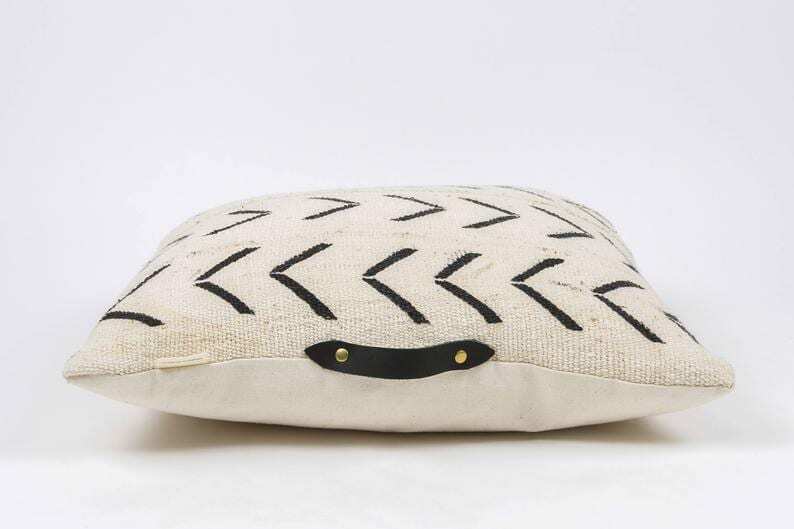 You and your guests will love them! 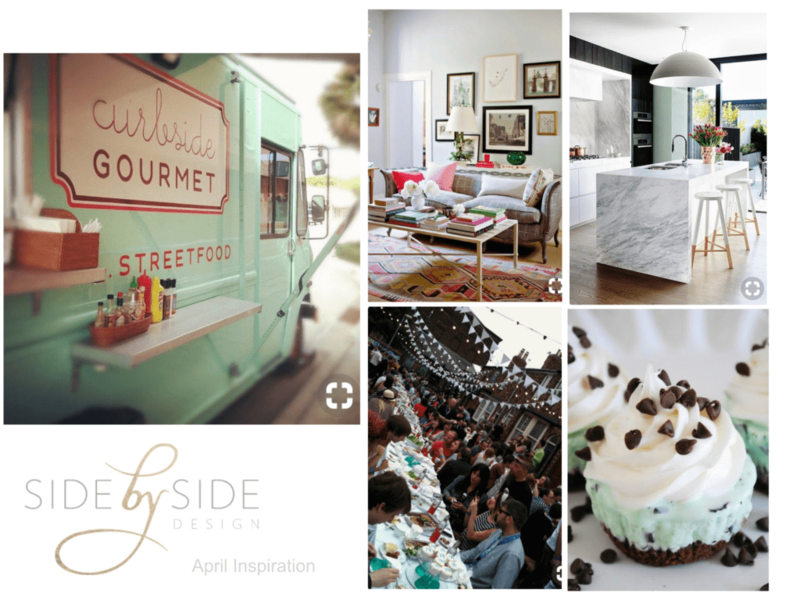 Have a great weekend from Side by Side Design! Contact us to book spring event services before May 31st and receive 15% off! 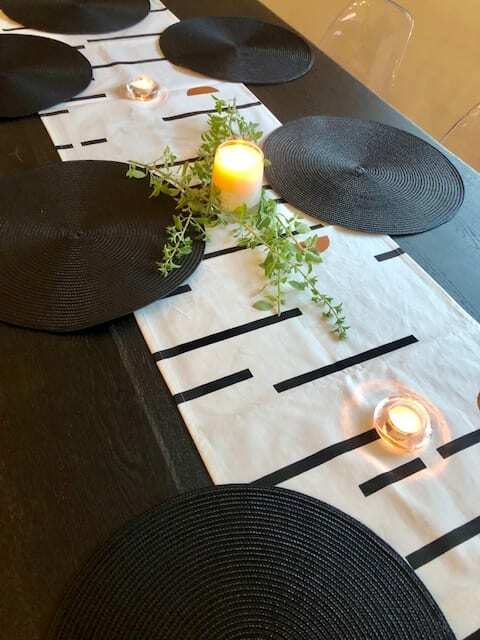 Custom Tablescape to Fit the Look of Your Home and Event – As we are an Interior Design + Event Planning company, our favorite thing to do is to go into a client’s home and base our event design on what they already have going on. The idea is to dress up your existing space and make it holiday and party ready. 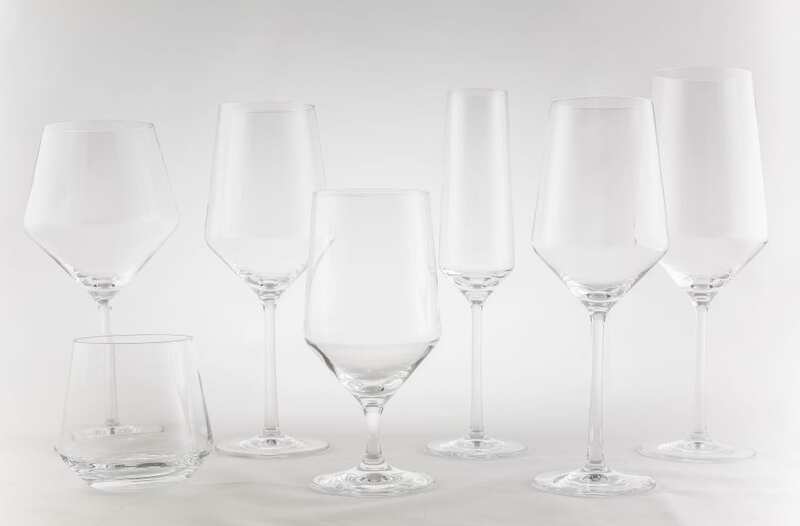 This includes the look of your table (linens, china, floral centerpieces, and more) for your Easter dinner, Passover seder, Mother’s / Father’s Day brunch or BBQ, or any other special occasion. Weekly / Monthly Home Floral Installations to Always Have Those Gorgeous Seasonal Blooms on Hand – This time of year, the flowers are in bloom! They should be present all over your house as well! 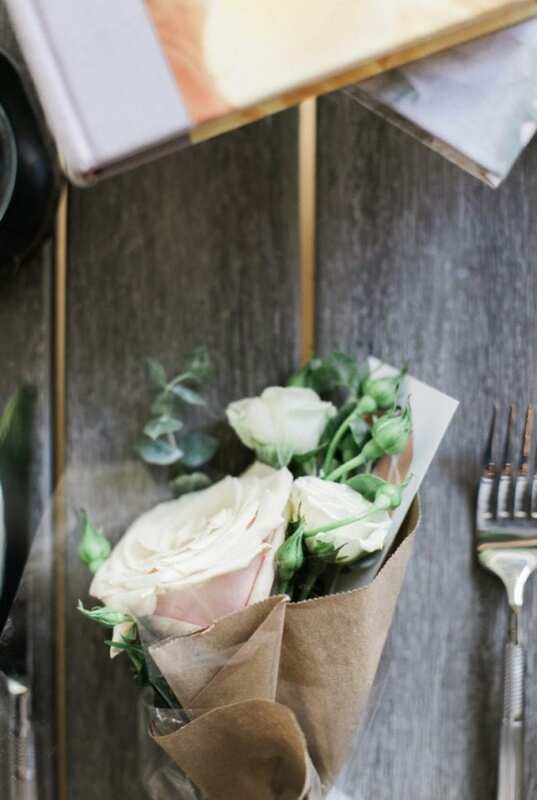 We can ensure that these spaces always have fresh flowers in them (especially when you’re having guests over). 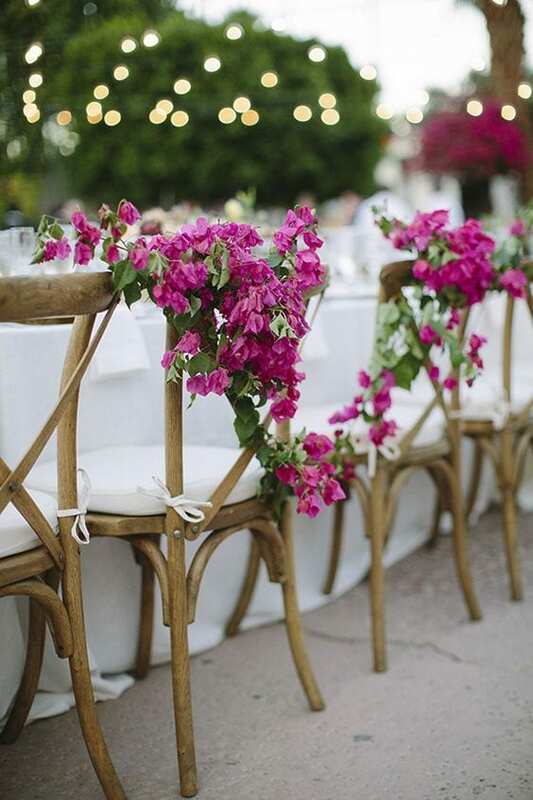 We work with the best of the best florists LA has to offer! 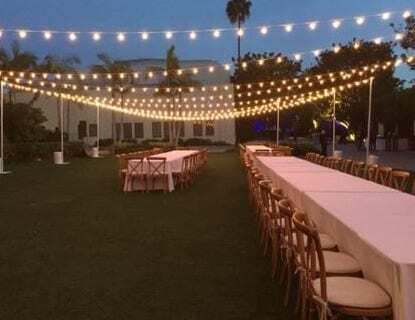 Overall Coordination for All Passover, Easter, Mother’s Day, Father’s Day, and / or Graduation Events (can also be used for any other event in your home this spring) – Having a party this season? We are your girls! 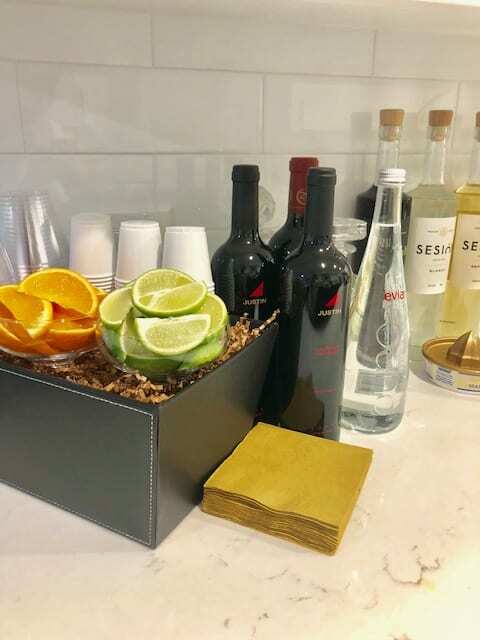 We will take care of all the details and make sure that there is no stress on your end, so you can just sit back, relax, and enjoy being with your friends and family! 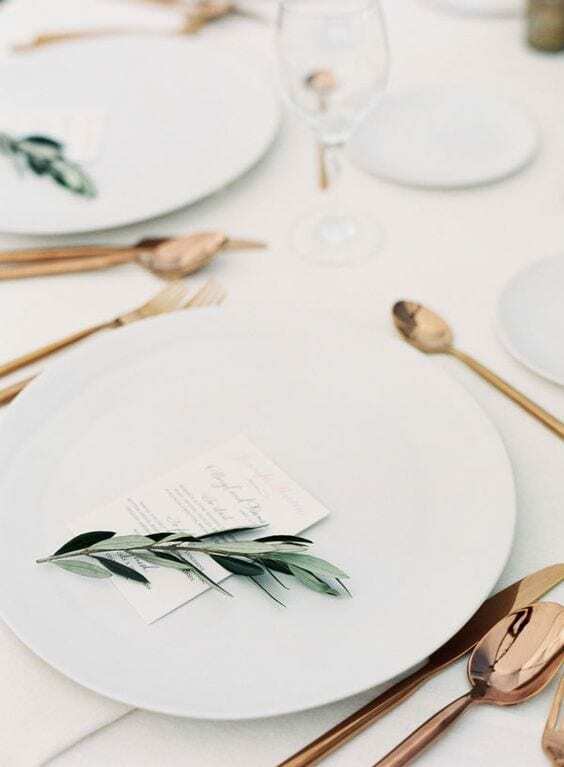 We can connect you with amazing caterers, florists, rentals … You name it! All from our personal preferred vendor list. Work with Our Team to Customize and Design Cookies and Other Treats for Your Event – One of our favorite gals to work with has been creating some incredible custom cookies lately designed to fit the look of your party or event. We thought we’d include her here cuz we’d love to collaborate with her some more! 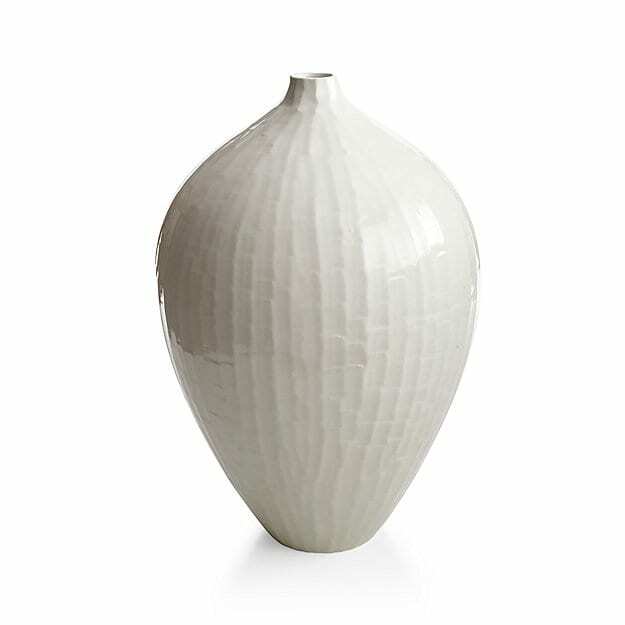 Decor Rentals (including full sets of candle holders, vases, apothecary jars, etc.) – We have a lot of rentals to offer from our event inventory as well! 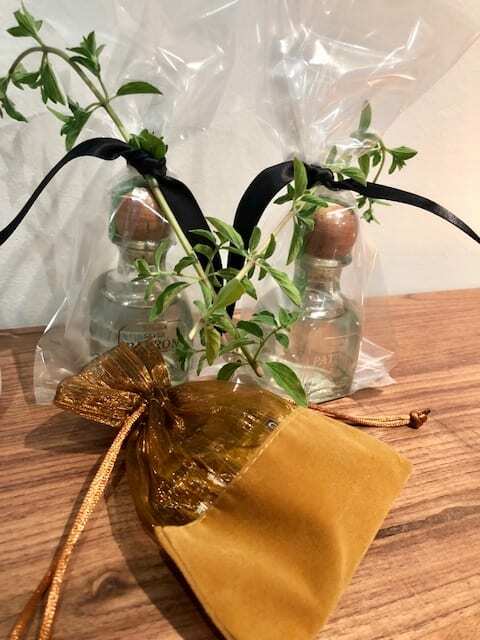 Full sets of mercury glass candle holders in all different shapes and textures, a gorgeous display of glass apothecary jars, and vases in every shape and size for all of those beautiful flower arrangements you will have around … Just to name a few. “Time to Get Organized” – Organization of One or More Areas of Your Home in Collaboration With It’s Organized – Spring is known for being a good time to go through your stuff and organize it. Why not hire a professional? We are collaborating with It’s Organized (a local business owned by our friend and “mompreneur” Cheryl). Together, we can help you make those beautiful spaces in your home much less cluttered and feel fresh and new! Additional Services By Request That Fit Your Design Needs This Spring –As we said, everyone has different needs this time of year. If we did not list yours above, contact us and we are sure we can come up with a plan. We look forward to working with you this season! For more information on any of the above services please contact us at info@sbsdesignla.com or call Tami Daks, our Event Coordinator, at (480) 628-8264. We are so excited to once again share our monthly inspiration with all of you! Each month, we look forward to getting the chance to sit down and really think about what’s inspiring us, make predictions for the month ahead, and reflect on the past month. As usual, we have each selected a photo that represents our overall inspiration and have paired it with two interior shots and two events that coordinate with its color scheme and overall concept. In addition, we have provided you with our designer tips to keep you on trend for the month ahead. Tami’s inspired: This one has been in the works for a while! It really is such a blessing when a client comes my way who trusts me fully and allows my creative juices to flow. 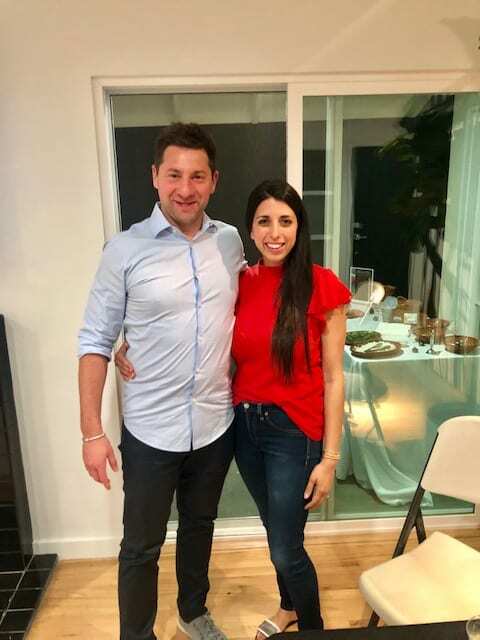 Together, we came up with an awesome theme that fits this casual and fun family to a T. Spencer’s Block Party Bar Mitzvah is just around the corner, and what am I most excited about? The colors, the games, the food (of course) … So many things! I always love to finally see our visions and inspiration come to life! 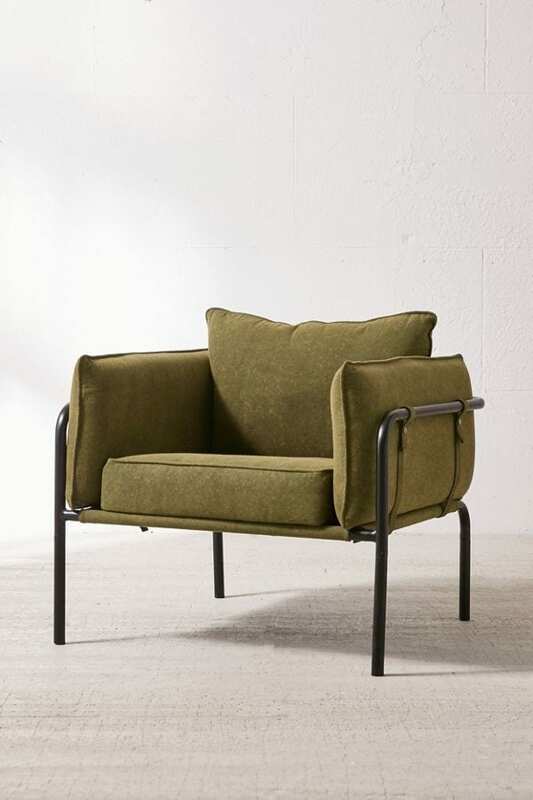 What’s my designer tip this month? Channel the essence of the block party feel in your home and event decor! Block parties are all about keeping it casual and having fun. 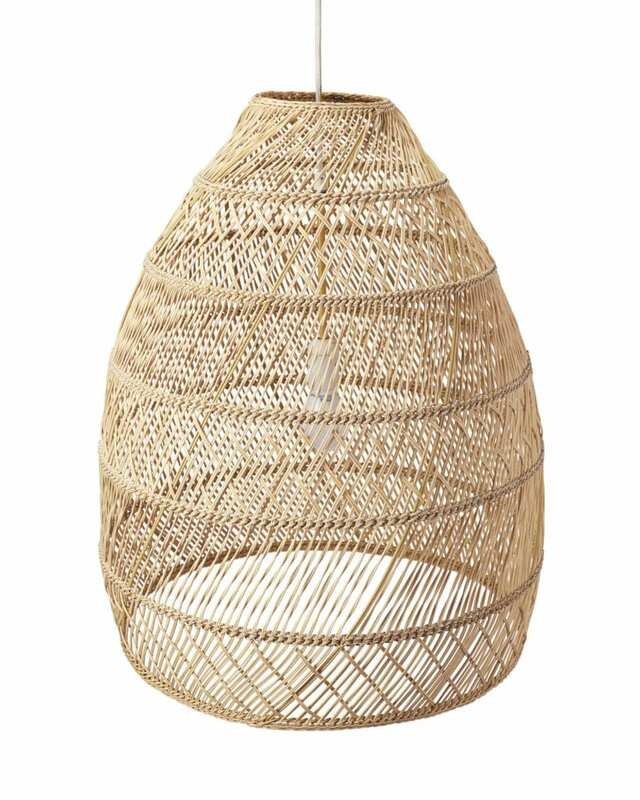 You can incorporate aspects of this into your home by adding a few strands of bistro lights to the outdoor patio where you dine, place fun colored pillows and a printed rug in your lounging space, and bring the outdoors in all year long with fresh seasonal flowers. Having a party? It’s simple … Line long tables up and invite all your friends. Invite that food truck you’ve been craving too! The whole block will thank you! Make sure to have plenty of fun mini desserts to enjoy too. Lauren’s inspired: This month is full of celebrations … AGAIN! I have my husband’s birthday next week, a Bar Mitzvah like Tami mentioned, Spring Break, and a little trip planned for a friend’s 40th. To celebrate Scott’s birthday, I am hosting a few friends for a tacos and tequila night at my house. You know I love to host! Looking forward to a fun month ahead! 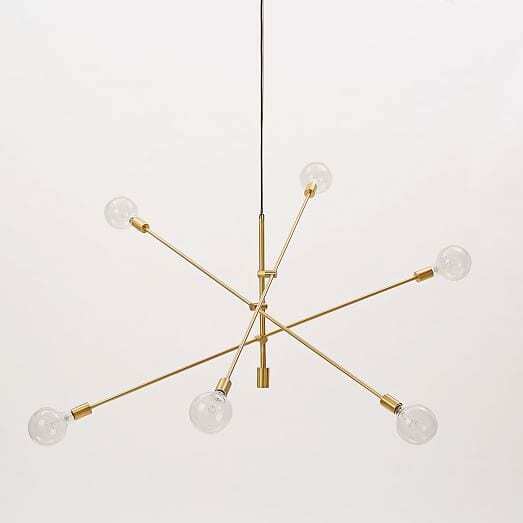 What’s my designer tip this month? Spice it up! Adding in some unexpected details will do what salsa does for a taco. Just makes things more interesting! 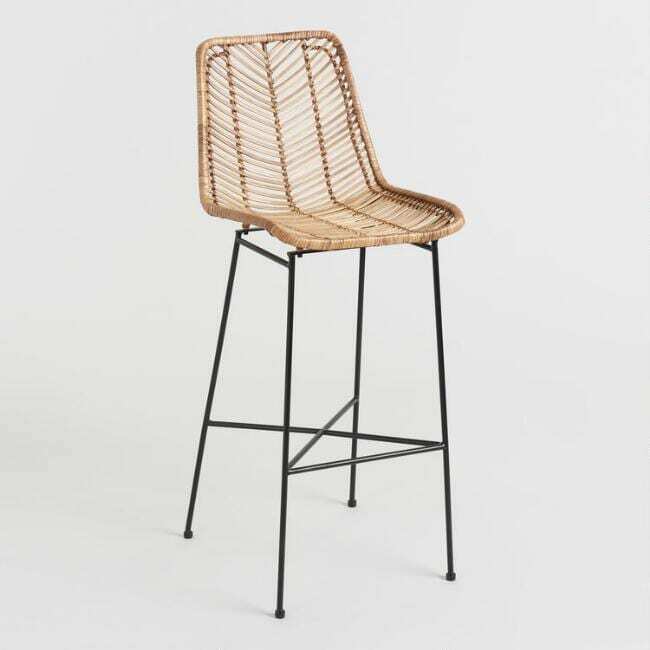 Add in some fun patterns or a pop of gold, use unexpected chairs in your outdoor eating area, and create a room where each piece makes its own statement. As for the party, make sure to have lots of tacos and tequila! 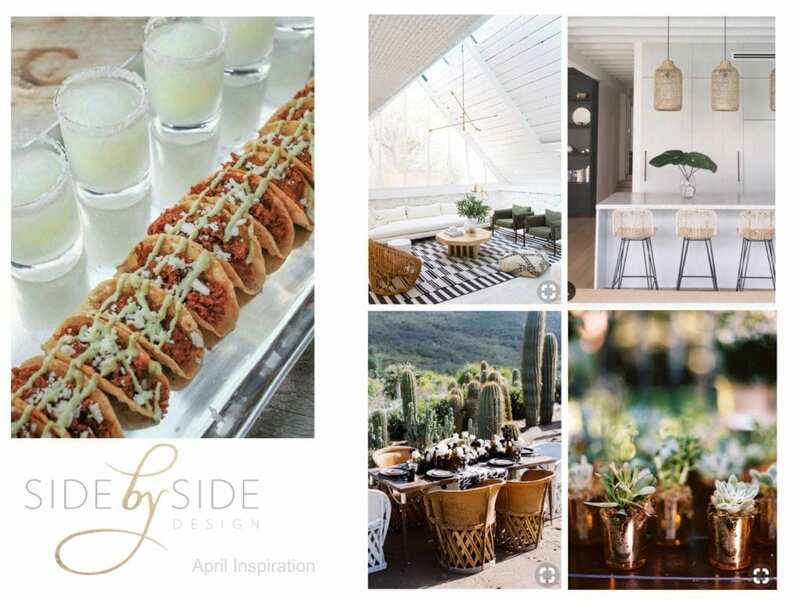 Here at Side by Side Design, we look forward to an exciting month including all the details from the Block Party Bar Mitzvah Tami has been planning, lots of tacos and tequila, some more finished spaces from Lauren’s Modern Bohemian Home Tour, and more! Don’t forget to check out our next Get Inspired post on May 3rd for all new looks and inspiration! Also, check out our weekly Instastories feature “Designer Day!” @sidebysidedesign to see how we fill our days with the things we love.